I know what you’re thinking. What kind of a dessert is this? Is Fatima out to poison us? Well not today, I’m not. This innovation blew me away too. I didn’t even know my brain had the capacity to come up with such, but it did! Thanks to the boring library! I got my friend Karena to help me out (not that I needed it :P) but because she was invited too, might as well share the love. 3. 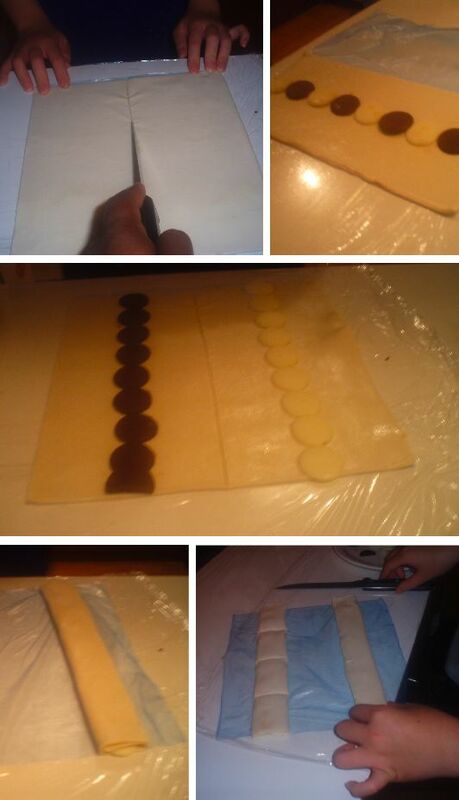 Align the chocolate in a line in the middle of each side of the pastry as shown above. We ended up using dark chocolate and white chocolate as opposed to just milk chocolate. 4. 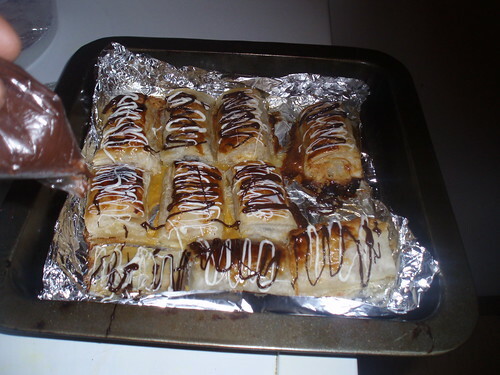 Fold each side of the pastry, wrapping the chocolate line in the middle. Now you’ll have 2 rolls each about 1.5” inches wide. 5. Cut each roll into four 4 mini rolls. 8. Lightly glaze the surfaces with the egg and using a cooking brush and put in the oven. I actually added honey to my egg and used it not only as a glaze but a sweetener as well. 10. 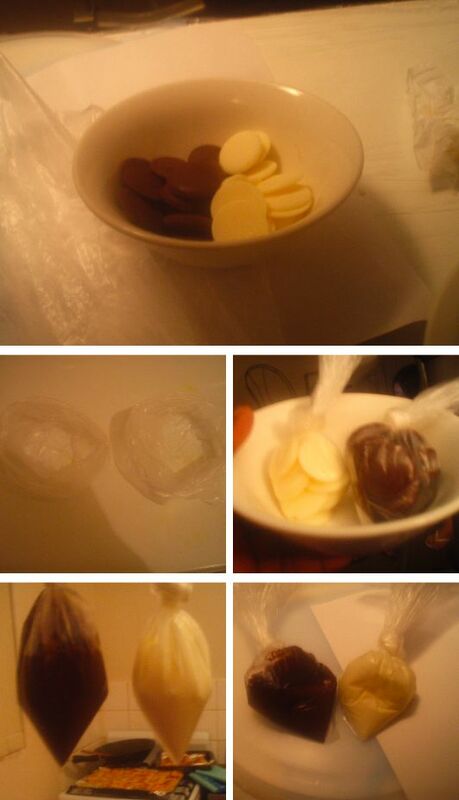 Place chocolate into the corner of the bags and tie it well. 11. Place the chocolate on a plate (you’ll thank me for this later) and microwave on “High” for 90 seconds. 12. 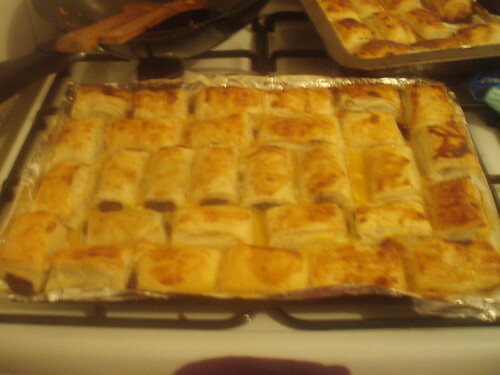 Now go check on your pastry and make sure it hasn’t burnt! If it hasn’t give yourself a pat on the back, then turn on your music, dance like no one’s watching and take crazy narcissistic pictures of yourself while you wait! 13. Finally! It is done. 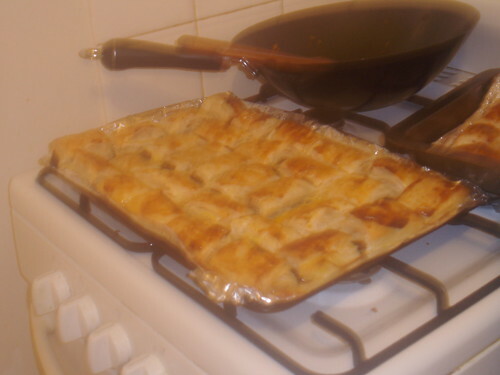 You pull your picturesque honey golden looking delicacy out of the oven and straight into the fridge. (Huh?) Just do what I said and don’t ask questions! Hehe I have to admit, I can get a little bossy when it comes to kitchen stuff (Forgive me Karena! *sniff sniff*). 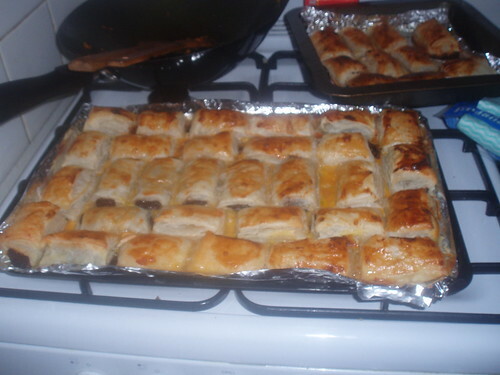 You need the pastry to cool so that you can garnish it beautifully. 14. 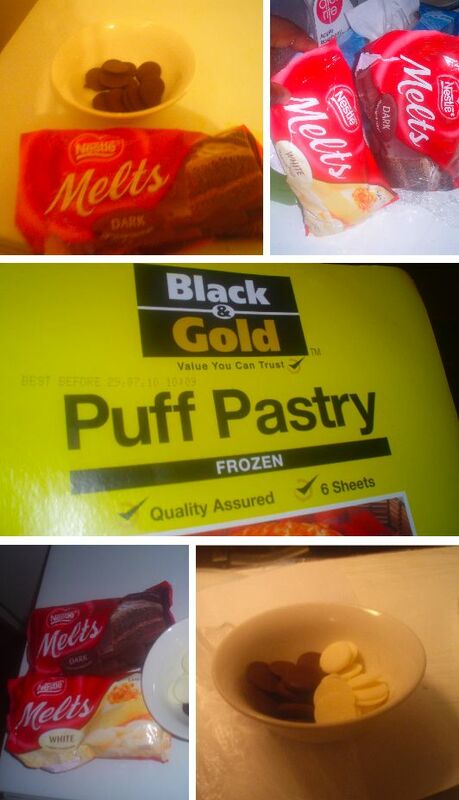 When it’s cool, make a pin sized hole in the tips of the plastic bag and use the micro-waved chocolate as a piper! You see I don’t have any baking utensils so I had to improvise. 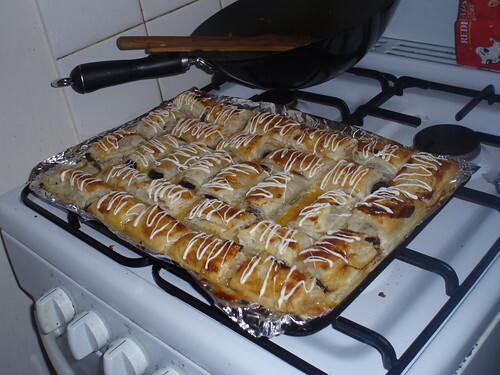 Make squiggly swirls with the chocolate and give your beautiful pastries a professional look. And you’re done! All ya have to do now is eat it! Lots of creamy Chocolatey love! Did you know that everything for this cost less than $10? That’s a real bargain in these times of recession (hehehe! I had ta add that in). 4 Responses to Fatima’s Guide to life! yummy,i want.Been salivating since i saw it.